I actually found it in a lower res a few months ago, but this one is much better. Another link I found months ago. Trespasser is mention once. So I've continued to look through old magazine after Trespasser article in hope to find any early images we haven't seen yet and came across this E3 1998 layout map. Dreamworks is not listed so I would guess they count as one of the EA ones. 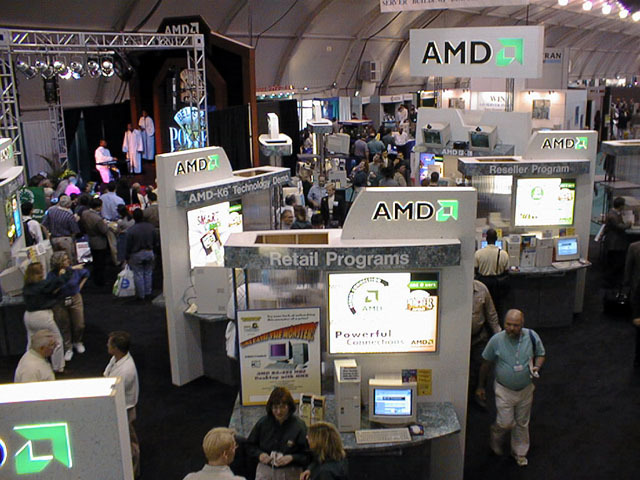 I'm also looking for pictures from the Comdex Falll '97, where Trespasser was premiered at the AMD booth. 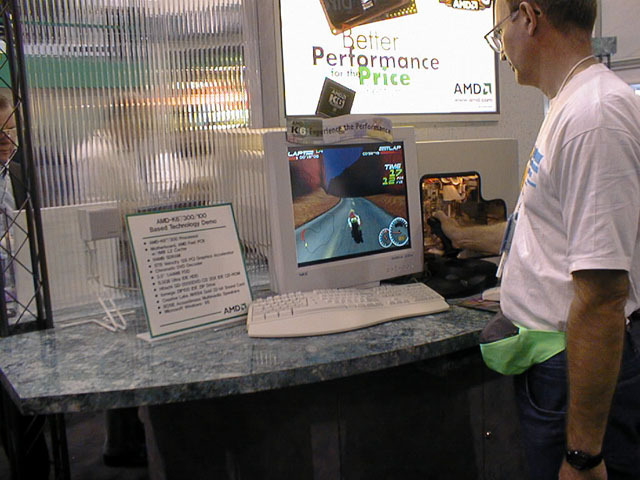 AMD was also cooperating with Dteamworks Interactive and Krelle showed a demonstration of a game called Trespasser due for release in the first half of 1998 on both the K6 3D and the Pentium II. 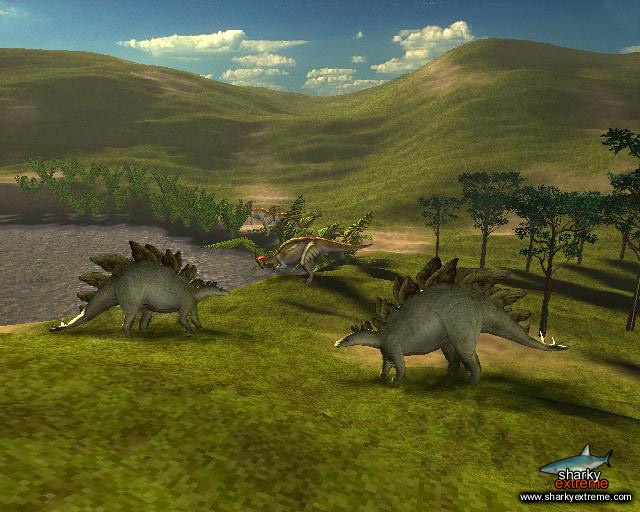 The game, set in a 15 square kilometer virtual island, uses 35Mbytes of texturing and ran faster on the AMD PC than the machine using the Pentium II. The game takes advantage of the 3D physics used in the AMD chip, said Krelle. AMD put a 266MHz version of the new CPU side by side with a comparably outfitted Pentium II 266. The demo being run was Dreamworks Interactive's Trespasser. Only software 3D rendering was being used in both machines. However, the Trespasser code recognized the additional 24 3D MMX instructions in the K6-3D part and put them to good use. The results: TWICE the framerate and 60% (average) greater FPU performance over the PII-266. If THAT isn't news I'll eat my mainboard! But thats not the whole story. In reality the new K6 part was more heavily loaded than the PII running alongside it. The version of the game running on the AMD hardware had additional features enabled that the PII did not support, resulting in greater realism in fog and water translucency effects. sharply contrasted lighting through a forest. I missed those. Sadly it seems a lot of the links are broken now, maybe it is time to archive them (if they are saved) and backup them to TresCom. I have copies. But they can still be found at the Internet Archive, too. Okay, so I don't want to make a new topic only for this. But Rolf Mohr just posted this on his Facebook. We already have this image but we never had it in this high resolution before! Original name of image was "Dinoplain or Plainview.JPG"
Maybe he has something else? Apparently he took a piece of the Visitor Center with him while on tour, during development. It's too bad we don't have terrain rendering like THAT in Tres...proper terrain textures with smooth blending, looks almost like Source Engine! Also, are any of the objects seen in that image found in any builds we have? They all look different to me. The tree on the right even looks to be added in post-render. The tree on the right even looks to be added in post-render. That tree is the same kind seen in other Plains images, and it's included (although without textures, sadly) in the Plains MAX file. I haven't really had the time to go too in-depth! But I think I can safely say I've never seen most of these objects in any level. Are you sure about that, machf? The ones in the distance look like what you're talking about, but the one on the right doesn't even look like a model...it looks painted on. Look at the texture of the branches and leaves, it's like some kind of default brush in Photoshop or something. Compare the edges of the branches with the edges of the branches on the small evergreen in the bottom-left - the evergreen's edges are blurry and aliased, as they would have been, but the tree on the right is crisp and smoothly blended with the background. I don't know about you, but it just doesn't look right to me.